Győr (Hungarian pronunciation: [ˈɟøːr] ( listen); German: Raab, names in other languages) is the most important city of northwest Hungary, the capital of Győr-Moson-Sopron County and Western Transdanubia region, and—halfway between Budapest and Vienna—situated on one of the important roads of Central Europe. The city is the sixth-largest in Hungary, and one of the seven main regional centres of the country. ✪ Győr: Oblíbené maďarské termální lázně Ráb poblíž Bratislavy! The area along the Danube River has been inhabited by varying cultures since ancient times. The first large settlement dates back to the 5th century BCE; the inhabitants were Celts. They called the town Ara Bona "Good altar", later contracted to Arrabona, a name which was used until the eighth century. Its shortened form is still used as the German (Raab) and Slovak (Ráb) names of the city. Roman merchants moved to Arrabona during the 1st century BCE. Around 10 CE, the Roman army occupied the northern part of Western Hungary, which they called Pannonia. Although the Roman Empire abandoned the area in the 4th century due to constant attacks by the tribes living to the east, the town remained inhabited. Around 500 the territory was settled by Slavs, in 547 by the Lombards, and in 568–c. 800 by the Avars, at that time under Frankish and Slavic influence. During this time it was called Rabba and later Raab. Between 880 and 894, it was part of Great Moravia, and then briefly under East Frankish dominance. The Magyars occupied the town around 900 and fortified the abandoned Roman fortress. Stephen I, the first king of Hungary, founded an episcopate there. The town received its Hungarian name Győr. The Hungarians lived in tents, later in cottages, in what is now the southeastern part of the city centre. The town was affected by all the trials and tribulations of the history of Hungary: it was occupied by Mongols during the Mongol invasion of Hungary (1241–1242) and then was destroyed by the Czech army in 1271. After the disastrous battle of Mohács, Baron Tamás Nádasdy and Count György Cseszneky occupied the town for King Ferdinand I while John Zápolya also was attempting to annex it. During the Ottoman occupation of present-day central and eastern Hungary (1541 - late 17th century), Győr's commander Kristóf Lamberg thought it would be futile to try to defend the town from the Turkish army. He burned down the town and the Turkish forces found nothing but blackened ruins, hence the Turkish name for Győr, Yanık kale ("burnt castle"). During rebuilding, the town was surrounded with a castle and a city wall designed by the leading Italian builders of the era. The town changed in character during these years, with many new buildings built in Renaissance style, but the main square and the grid of streets remained. In 1594, after the death of Count János Cseszneky, captain of Hungarian footsoldiers, the Ottoman army occupied the castle and the town. In 1598 the Hungarian and Austrian army took control of it again and occupied it. During the Turkish occupation the city was called Yanık Kala (burned place, as a reference to the enormous damages caused by the siege). In 1683, the Turks returned briefly, only to leave after being defeated in the Battle of Vienna. During the following centuries, the town became prosperous. In 1743 Győr was elevated to free royal town status by Maria Theresa. The religious orders of Jesuits and Carmelites settled there, building schools, churches, a hospital, and a monastery. In June 14, 1809, during the War of the Fifth Coalition this was the site of the Battle of Győr (Battle of Raab), where the army of Eugène de Beauharnais defeated the Hungarian "noble insurrection" (militia) and an Austrian corps under the Archdukes Joseph and Johann. Napoleon's forces occupied the castle and had some of its walls blown up. The leaders of the town soon realized that the old ramparts were not useful any more. Most of the ramparts were destroyed, allowing the town to expand. In the mid-19th century, Győr's role in trade grew as steamship traffic on the River Danube began. The town lost its importance in trade when the railway line between Budapest and Kanizsa superseded river traffic after 1861. The town leaders compensated for this loss with industrialisation. The town prospered till World War II but, during the war, several buildings were destroyed. Some large-scale terror-bombings devastated the industrial and some residential areas and the airport, because the Rába factory was a main tank (Turán) and aeroplane (Bf 109) producer. One of these raids destroyed some parts of the maternity hospital. A 100-year-old Raba factory on the River Danube close to the historical centre is to be replaced by a new community called Városrét. The mixed-use community will have residential and commercial space as well as schools, clinics and parks. The city's main theatre is the National Theatre of Győr, finished in 1978. It features large ceramic ornaments made by Victor Vasarely. The city has several historical buildings, for example the castle, and the Lutheran Evangelic church. The ancient core of the city is Káptalan Hill at the confluence of three rivers: the Danube, Rába, and Rábca. Püspökvár, the residence of Győr’s bishops, can be easily recognized by its incomplete tower. Győr’s oldest buildings are the 13th-century dwelling tower and the 15th-century Gothic Dóczy Chapel. The Cathedral, originally in Romanesque style, was rebuilt in Gothic and Baroque style. The Pannonhalma Archabbey is located some 20 km (12 miles) outside the town. After the year 2000 the city started many big construction and renovation projects. The Nádor-underpass, which relieved the Downtown's traffic infrastructure, and made the renovation of the Baross-Bridge possible. Renovation of the old Soviet barracks and Bus Station by the company Leier. Development of the Széchenyi István University, which is in close connection with AUDI Hungária ZRT. Renovation of the inner-downtown district. Széchenyi-square, Dunakapu-square, the territory next to the Moson-Danube and Rába. Free City Bus which can used by everyone to get anywhere in the Downtown Area. The Győr Arcade at Városliget. The Kálóczy Square near the Széchenyi István University. The Jedlik Bridge, which enabled traffic & transport between Sziget and Révfalu district. Audi AG subsidiary company Audi Hungaria Motor Kft. has a large factory in Győr, where the Audi TT sports car, the A3 Cabriolet, A3 Limousine, and many engines (1,913,053 engines in 2007) are built. The factory opened in 1994, at first producing inline-four engines for the Audi marque. Business then grew to assembling the Audi TT Coupé and TT Roadster. Eventually, V6 and V8 engines were also included, and after the acquisition of Automobili Lamborghini S.p.A., Audi then began to build V10 engines. The V10s for Audi vehicles are fully assembled here, but only the cylinder blocks for the Lamborghini V10. Engines are also supplied to other Volkswagen Group marques, but over 90% of Audi vehicle engines are made here. Győr is the home of the Győri ETO Sport Club, which has many sport divisions. The most popular sport in the city is handball, with the Győri ETO KC being the city's main team. Győri ETO FC is a football team. ^ a b "Gazetteer of Hungary, 1 January 2017" (PDF) (in English and Hungarian). Hungarian Central Statistical Office. 2017-10-05. p. 52. Retrieved 2018-01-19. 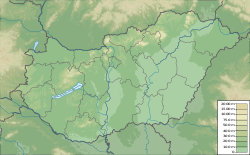 ^ "Royal Hungary (historical region, Hungary) -". Britannica Online Encyclopedia. Retrieved 2011-09-16. ^ Sugar, Peter F.; Hanák, Péter; Frank, Tibor, eds. (1990). A History of Hungary. Bloomington: Indiana University Press. p. 97. ^ "Győr ostroma. | Borovszky Samu: Magyarország vármegyéi és városai | Kézikönyvtár". www.arcanum.hu (in Hungarian). Retrieved 2018-09-26. ^ Endre, Kozma. "Az 1944. április 13-i győri terrorbombázás - Régi Győr". regigyor.hu (in Hungarian). Retrieved 2018-09-26. ^ "Győr éghajlati jellemzői" (in Hungarian). Meteorological Service of Hungary. Retrieved 7 December 2015. ^ "Start of production and world premiere for the Audi A3 Cabriolet in Hungary". Volkswagen AG. 30 November 2007. Archived from the original on 20 November 2008. Retrieved 30 August 2009. ^ "World Industrial Reporter – Audi Hungaria Celebrates Start of Production of A3 Limousine". © 2013 Thomas Publishing Company. 2013-06-13. Retrieved 2013-07-17. ^ "Lamborghini Cars full specifications - First spyshots of the Lamborghini L140 model". LamboCars.com. Archived from the original on 2005-04-18. Retrieved 30 August 2009. ^ "Audi ups Hungarian output". BBJ.hu. Archived from the original on 2008-06-21. Retrieved 2 January 2012. ^ "www.gyor.hu - Twincities of Győr" (PDF). Admin.gyor.hu. Retrieved 2011-03-10. ^ Официальный сайт города Брянска (in Russian). Admin.bryansk.ru. Archived from the original on February 14, 2008. Retrieved 2009-07-08. ^ "Poznań - Miasta partnerskie". 1998–2013 Urząd Miasta Poznania (in Polish). City of Poznań. Archived from the original on 2013-09-23. Retrieved 2013-12-11. Wikimedia Commons has media related to Győr. Wikivoyage has a travel guide for Győr.